Richard Thomas, Therese Plaehn, Pamela Reed, Lauren Klein, Daisy Eagan, Luis Vega in a scene from “The Humans.” Photo: Julieta Cervantes. It is Thanksgiving Day. A family gathers in the Manhattan Chinatown apartment that one of the daughters shares with her boyfriend. Grandmother, in a wheelchair, only somewhat “with it.” Sister, dealing with recent breakup. Mom, mother hen-ing, and Dad, doing his version of same. Boyfriend pours wine and bustles in the kitchen. If there is to be a play, beyond the (very) funny patter, something more has to happen, and therein lies the genius of “The Humans” by Stephen Karam. We know it will. Pause. The family does not crumble. It could at any minute, and it might still after the final blackout. But then again, it might not. They love each other, they really do, but boy, things get into a real mess. With multiple major awards, including the 2016 Tony for Best Play, it’s clear that mid-century (that would be the last century) realism has made a solid comeback. I, for one, am thrilled to see the ordinary dilemmas of regular folks elevated to significant drama. Arthur Miller comes to mind. Karam’s deft use of comic situations and dialog hook us in; but it’s his story line that impresses me more. Rather than sucker for an unspeakable tragedy (or worse, elements of fantasy), he chooses painful realizations, the fallout from ordinary human frailties and a life-goes-on-somehow response. Simply beautiful. Richard Thomas (John-Boy Walton, for those of us who watched TV in the last century) plays Erik Blake, the father – a man who stands on his own two feet, until he doesn’t. Pamela Reed as Deirdre Blake has a bit of a sterotype to manage as a meddling and sometimes ditzy mother, but she grabs the nuances to create someone fresh and utterly appealing. 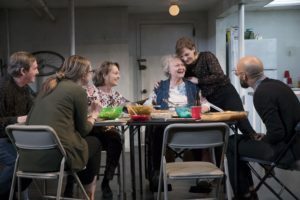 Lauren Klein creates a wonderful poignancy for her character, “Momo,” the grandmother; the sisters, Brigid and Aimee, played by Daisy Eagan and Therese Plaehn counter balance each other touchingly. Luis Vega as Brigid’s boyfriend, Richard, also has a balancing act between being not-quite-family and in love with Brigid. He tries just a little too hard and we love him for it. This is a Broadway touring production, brought to the Twin Cities by the Hennepin Theatre Trust and housed in the Orpheum downtown Minneapolis, and this is its one difficulty. It’s an intimate play in a gigantic space. That’s an issue all by itself, but I also couldn’t hear everything. Don’t let this scare you away, though. It’s still very much worth seeing. It runs only through this Sunday, February 18.